View from the top of Hermitage in the Northern Rhone looking down at the city of Tain. The first time I experienced Syrah, I was training as a food runner at Eleven Madison Park. The year was 2008. The wine director at the time, John Ragan, was teaching the staff about a new glass pour from St. Joseph in the northern Rhône Valley (I don’t remember the producer). I put my nose into the glass, and the aroma of fresh black pepper was so overwhelming that I sneezed. “Who in the world...” I thought, “would want to drink this stuff?? ?” Ten years later, the answer is ME! As we spoke about in our Elevations & Extremes article, the spiritual homeland for Syrah is the northern Rhône Valley of France. Some of France’s most iconic producers call this region their home. Jean-Louis Chave, Alain Graillot and his son Maxime, Louis Barruol, Alain Voge, and the almost unattainable Auguste Clape, Domaine Jamet and Thierry Allemand. Jean-Louis Chave is an unassuming, soft-spoken, almost shy, country boy. His wines are the opposite. The Chave family began making wine in the northern Rhône in the late 1400s. As Andrew Jefford writes in The New France, “The Chave line ... could make a fair claim to be France’s winemaking royal family: in no other of France’s great terroirs is the largest individual landholder so deeply rooted in time and place, so supremely competent, and so modest a custodian of the insights and craftsmanship of the past.” In addition to producing benchmark wines from Hermitage, the Chaves also produce wine from St. Joseph. The Graillots, Father & Son, Old School & New School. Maxime Graillot is one of our favorite “new” producers from this region. Maxime’s father, Alain Graillot, started making wine in Crozes-Hermitage in the mid 1980s, after returning from Burgundy where he worked with the legendary Jacques Seysses of Domaine Dujac. Maxime worked with his father from a young age, and in 2004, started making wine under his own label. Alain’s style could be considered more traditional (he does not de-stem, so wines have more of a “green” quality), while Maxime’s wines have a bit more fruit and power behind them—representing the best of old-school and new-school Syrah. Thierry Allemand, Insane Wine from the Wilderness. Thierry Allemand, of Cornas, makes some of the best wine. In the world. Hands down. Without a doubt. Desert island wine. Don’t care how hot it is. I would drink his wine on the surface of the sun. Allemand is synonymous with Cornas, meaning “scorched earth,” an AOC known for being “lesser” in quality compared to the other villages of the northern Rhône. This reputation is due in part to negociants making hard, tannic wines and not giving the care to Syrah that it deserves. In the 1980s, quality winemakers started making their way into Cornas, with Allemand at the helm. Allemand started acquiring abandoned parcels. The work was grueling: clearing out brush, building terraces, replanting vines—and it was a full 15 years before he was able to devote himself and make a living from the vine. He had previously been an electrician. 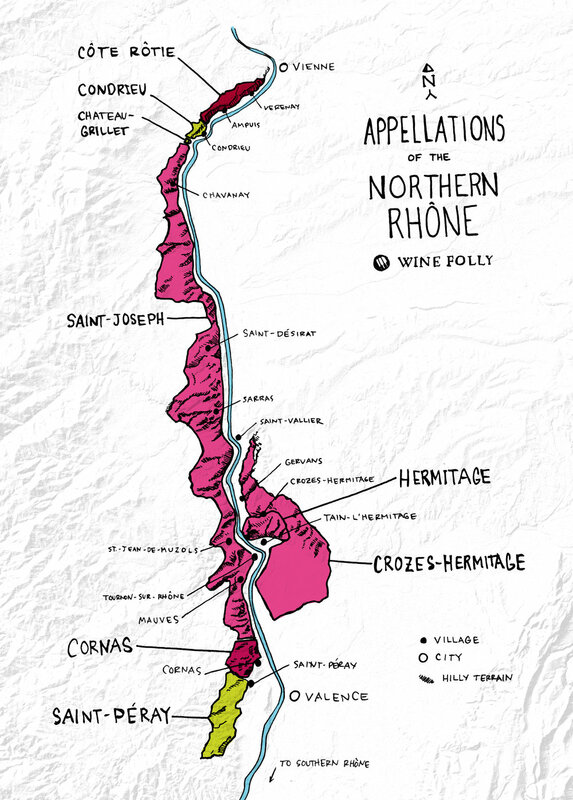 Like the best vineyards in the northern Rhône, soils in Cornas are comprised of granite and limestone. Allemand certainly deserves the cult status that he and his wines have earned. If you are interested in getting some wines from the Legends of CHAVE, ALLEMAND, CLAPE, JAMET.